Add some extra fun to your Halloween treats with Slimy Monster Cupcakes. 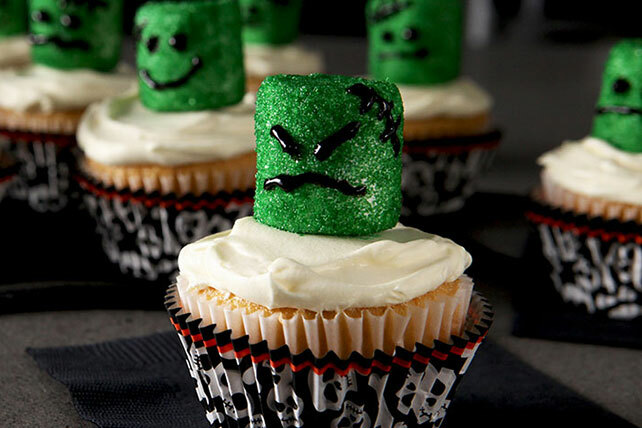 Marshmallows go undercover as slimy green monsters for Halloween to top the moist and ghoulishly good Slimy Monster Cupcakes. Spoon 1/3 cup COOL WHIP into large resealable plastic bag. Add marshmallows; seal bag. Shake until marshmallows are evenly coated. Place decorating sugar in small bowl. Add marshmallows, 1 at a time; toss until evenly coated with sugar. Place in single layer on baking sheet. Decorate with decorating gel to resemble monster faces as shown in photo. Beat pudding mix and milk in medium bowl with whisk 2 min. Stir in remaining COOL WHIP. Spoon 1-1/2 cups pudding mixture into small bowl. Add food coloring; stir until blended. Spoon into small resealable plastic bag. Snip one corner off bottom of bag. Cut 1-inch piece from top of each cupcake with small knife; remove and reserve for snacking or other use. Pipe pudding mixture from bag into holes in cupcakes; spread remaining pudding mixture onto tops of cupcakes. Top with marshmallows. For more colorful cupcakes, add 1 or 2 drops each yellow and red food colorings to the remaining (plain) pudding mixture to tint it orange before piping into and spreading onto tops of filled cupcakes. Omit black decorating gel. Prepare and frost cupcakes as directed. Cut black licorice into small pieces. Use to make monster faces on the coated marshmallows before placing on tops of frosted cupcakes.